But what are the changes and how might they affect you? The new MoT test launches in just a week’s time in the UK (20 May) but what are the changes and how might they affect you? It’s estimated that around 30 million vehicles take an MoT test every year in the UK and according to the Driver and Vehicle Standard Agency (DVSA), these new changes will bring about cleaner and safer vehicles. As part of the changes there will be new stricter limits regarding smoke coming from diesel vehicles, as well as clearer fail categories – both changes should help improve the air quality in the UK and make our roads safer. 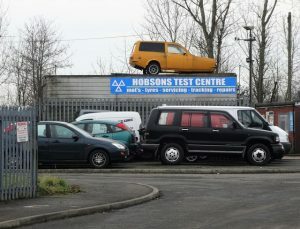 Just one week to go before the new MoT test launches in the UK © Copyright Neil Theasby and licensed for reuse under this Creative Commons Licence. The three clear fail categories to be introduced next week are Minor, Major and Dangerous. A vehicle showing a Minor fault will still pass its MoT test but the fault must be corrected as soon as possible. A Major fault is more serious and could be classed as a safety risk or damaging to the environment and will result in a failed MoT test. The issue must be rectified before a pass certificate can be given. A fault classed as Dangerous poses an immediate risk to the safety of other road users, as well as to the driver and therefore cannot be driven until the fault has been dealt with. An automatic fail will be issued. A few other changes will also come into effect on 20 May, including daytime running lights on vehicles first used from March 2018, reversing lights on vehicles first used from September 2009 and front fog lights on vehicles first used from March 2018. The MoT certificate and failure documents will be much clearer and easier to understand and will show the new defect categories, whilst vehicles over 40 years old that haven’t been changed too much will be exempt from the MoT test. MoT testing stations throughout the UK have been preparing for the new changes which will come into effect on 20 May 2018. An annual MoT test ensures your vehicle is fit for the road and motorists can help keep their vehicles safe to drive by carrying out simple maintenance checks throughout the year, such as checking that the tyres are inflated correctly and still have at least 1.6mm of tread, making sure the brakes are running smoothly and the vehicle doesn’t pull to one side, headlights and other lights are working and kept clean and making sure the windscreen wipers and washers are working. Please click here to find out more about our business/personal car leasing services and fantastic deals, or give us a call NOW on 0800 311 8290.